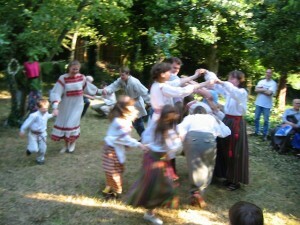 The Anglo-Belarusian Society invites its members and friends to the traditional Kupalle (Midsummer) celebration on Saturday 22 June 2013 at 3pm – 10pm in the garden of 39 Holden Road, London N12 8HS. The Anglo-Belarusian Society takes all efforts to ensure that this will once again be a celebration in the true Belarusian ethnographical tradition. Please assist us if possible by bringing along flower-crowns and wearing Belarusian costumes. The use of the Belarusian language will be encouraged! All gifts of cold food, both home-made and bought, will be welcome. Please note that there will NOT be a barbeque this year. Offerings of wine, beer and soft drinks will also be gratefully received, but – please – NO SPIRITS. The evening will conclude at 10pm. Pictures from last year’s Kipalle are available here. This entry was posted in ABS and tagged kupalle, london, Midsummer celebration. Bookmark the permalink.